They were children. Put on a train in a strange land, they waved goodbye to a parent as they headed to an educational institution that, unbeknownst to them, was to become their new home. Separated from their loving families, they strived to meet the expectations of the grownups and, in some cases, to rebel against them. Now, independent women, compassionate mothers, and astute professionals, they look back on their youth in the 1960’s and 1970’s to make sense of why they were sent away, and to give meaning to the sources that have sustained them over the years. Ex-boarders themselves, Latham and Ferdows provide vivid and emotionally embodied narratives of everyday lives of The Boarding School Girls. This unique collection of stories explores key issues of identity and lifespan development to seek understanding of the influence of national, religious and family culture on development within two conflicting sets of cultural values. Combining unique qualitative data with illuminating tales of resilience and accomplishment in what is likely to simultaneously inform and inspire readers with feelings of joy and sadness, love and hate, abandonment and hope, but mainly trust and forgiveness. The stories of eleven ‘little rich’ Persian girls are a nostalgic reminder of their past cross-cultural ordeals, a pragmatic perspective on psychological implications of boarding school education in England, and a celebration of the possibilities of the future. 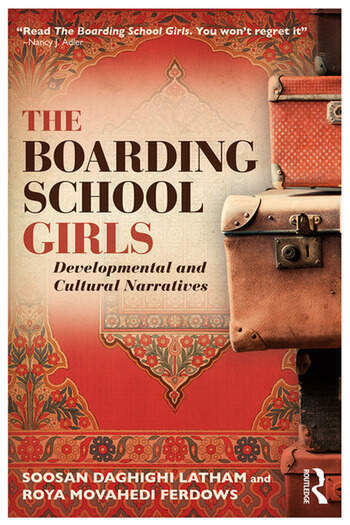 The Boarding School Girls is valuable reading for students in cultural, developmental and educational psychology and the humanities, as well as clinical psychologists and educators looking at the impact of boarding school on adolescent development. Soosan Daghighi Latham is a professor at York University and an Associate Coach with the Niagara Institute in Toronto. A PhD graduate of the University of Toronto she is a former Vice President of Human Resources at J.P Morgan Chase, and Assistant Dean, Executive Programs at Rotman School of Business, University of Toronto. Roya Movahedi Ferdows is an MBA graduate from Johns Hopkins University with a Post Master’s degree from George Washington University. Following several years of working in the corporate world, she is currently an Executive/Leadership Coach focusing her time on supporting clients find work/life balance and develop into better leaders.